Every so often, we will be treated to a boot that offers a new look to the market. And then there are boots that make us do a double look and take at least 5 minutes to really get our heads around. This list takes care of that second group. What we are looking at here are the boots that on release made us wonder what the heck was going on – whether that be in a good or bad way. A lot of the boots on the list we have become familiar with and in most cases they are now part and parcel of the game. But when released, these made us question what they had to offer the market. Enjoy – and make sure to let us know if there are any boots you would have added in the comment section below! It was the step like design across the forefoot that had people wondering if this was a space age release or just another boot destined to take the stairway to hell. Yes, the latter is definitely over-exaggerated but I wanted to get that pun in there somehow! Known as the 3D Power Shooting Technology, the lime green stripes that run across the strike zone are like little ridges that overlap across the front of the cleat. 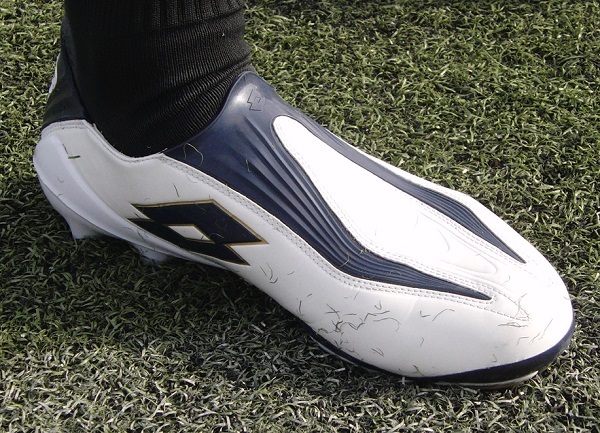 The official term was SpringTech foam ridges, and they were designed to increase shooting power while maintaining touch and feel on the ball. But man was it an odd look, and one that we didn’t see on the latest rendition of the PowerCat! 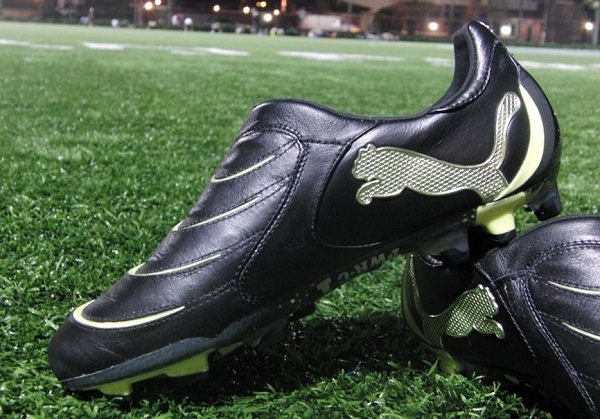 A boot that features no laces is definitely one that is going to grab any players attention! Lotto are the first company to really jump head first into the “no laces” design, although there is a reason that not many companies have even dared to take that direction in the past. Trying to create a boot that can’t be tightened using laces but fits the majority of players really seems like a ludicrous move. 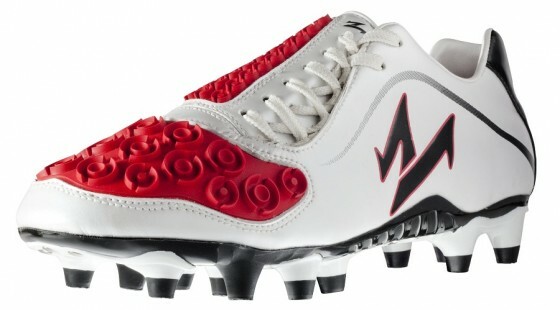 Players that have found the right fit LOVE the boots. But as I found out, there are a lot of us that just can’t do without our trusty laces! Probably the most futuristic, space age release we have ever seen! The initial Blur release had boot enthusiasts wondering if Under Armour had a bunch of Astronauts working on their design team. A unusual one-piece, Silver upper was perforated and shined up to produce an extra metallic effect almost like someone had covered it in aluminum file and pierced it multiple times with a fork. In reality, the Metallic Silver upper is a lightweight microfiber that has been perforated along the sides for extra ventilation and breathability. 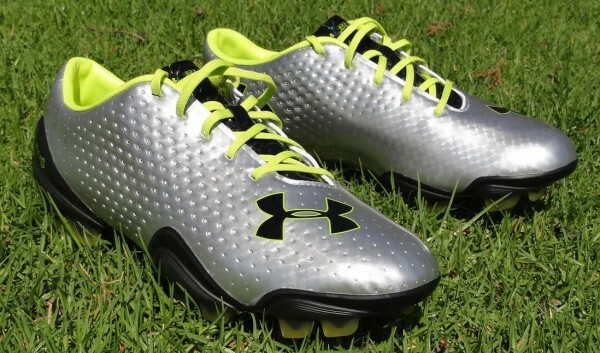 The soleplate also takes on a life of its own and almost looks like a mouthful of mis-positioned teeth. This German boot is built exactly as you would expect – solid and ready to hammer anyone that comes within five feet of them! First thing of note is the unusual colorway, with Orange detailing producing a slightly ridiculous and offbeat look. At least they have stuck it out with a traditional Black upper. When you add the sand paper like upper texture and the plastic ridges that contour around the lacing (or Ball and Touch Control), you have a finished boot that leaves you wondering what exactly is going on. On a final note, if you were wondering, Aspero use a Nappa leather on the upper – the same type of high-end leather we are used to seeing used on sofas. What could be better than a pair of boots that features some real Pony hair? Ok, so I am pretty positive that the power of the Pony hair is not going to improve performance in any way and I am pretty positive that a lot of people picked up on that when they were released. But the upper is made of a Pittards WR Premiership Goat Skin, which makes them pretty unique. Released in January 2006, there were only 1923 pairs made available and incredibly, they actually sold out pretty fast. Still, I think anyone that initially saw these would have questioned why there was a need for Pony hair! The newest boot released that sits on this list. I was one of those skeptics that questioned the design on release, but kudos goes out to the Warrior teams as they really have produced a winning boot. The mass advertising campaign and key player endorsements definitely helps things, but it is the boots actual performance that now leaves it as a winner. 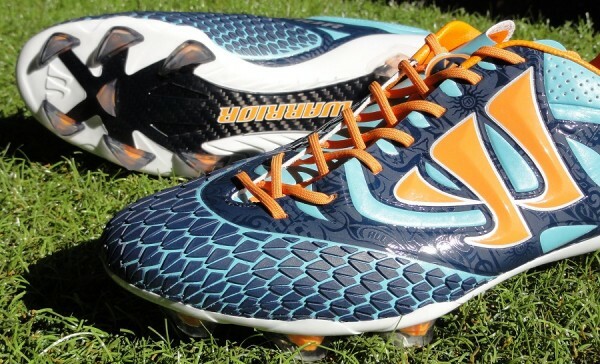 But on release the fish-scale design across the forefoot that was added to an extremely funky overall design left many wondering if Warrior were cut out for the soccer market. 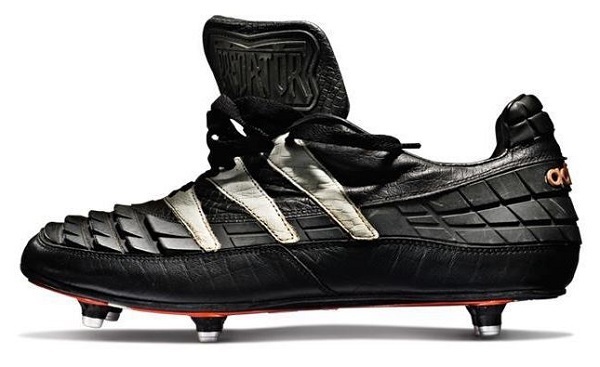 On release in 1994, many people wondered what the heck Adidas was playing at. Adding a ton of rubber elements across the strike zone was a completely new concept and way ahead of its time. It really sent shock-waves across the market. 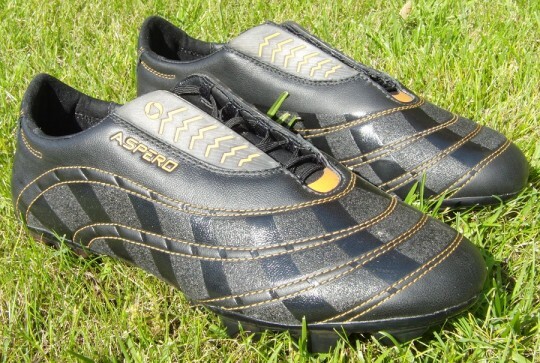 When we take a look at them now, it was a thing of beauty and all boot enthusiasts crave a pair for their collection. But this wasn’t so when they were released and many sat and wondered if anybody would actually wear them. They ended up selling is mass quantities, with several high profile players swearing by the boots performance, and the rest is history! This one is all about design, and that design really is absolutely nuts. 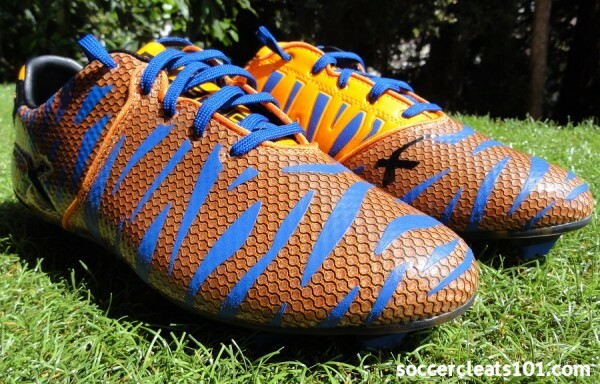 If XBlades were looking to gain the markets attention, I think they achieved it pretty successfully. Although, the problem is that you want to attract the markets attention with designs that people want to buy! The actual upper has a crocodile skin appearance, with the blue painter tape design across the forefoot adding an extra minty layer of detailing. There is a lot more going on with these included a Bionic sole system, but it is the mis-mash design that makes them stand as a “Whaaaaat” release. Placing a piece of plastic across the laces of a boot doesn’t seem like something a lot of companies would look to do. But Concave took on the challenge. 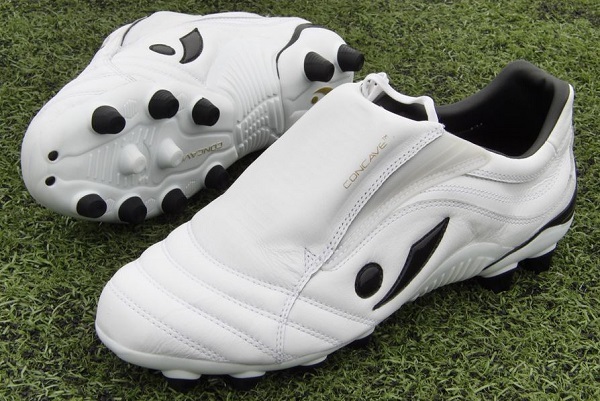 Its release coincided with the spike of metatarsal injuries that occurred before the 2010 World Cup and Concave pushed the idea that the extra protection offered not only help reduce the number of injuries, but it meant the boot was actually the ideal “injury recovery” boot. 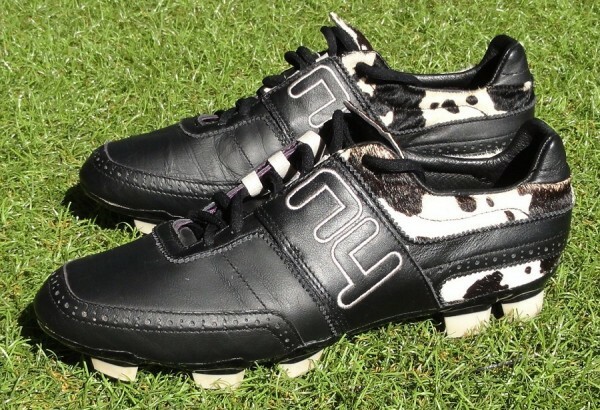 Unfortunately, fans didn’t agree and the boots never really sold even with powerful, creative, influential players like John O’ Shea and Wes Brown sporting them! Ahem. Any company that adds a bunch of suction cups across the upper is bound to get some funny looks and stares. Yet there has been a flurry of action in Australia for the brand and they continue to tout their cutting edge technology. The idea is that the pods perform like a spring, storing and releasing vital energy – sort of like when you push your body sponge suction cup onto the wall of your bathtub. In Zygo’s words “The ensuing friction provides exceptional grip – assisting ball control and accuracy“. Odd, unusual, curious and slightly bewildering.